Goodness, I have recently been on @achrisevans on www.bbc.co.uk/radio2 breakfast show as a mystery guest! It was a really nice surprise to talk about blacksmithing and working with your hands and I think rabbited on and I spoke for well over the allocated 3 minutes! I had no idea how many people listed to his show and have had a fantastic response from listeners, friends and blacksmiths. It was great to be able to speak up for the blacksmiths out there. Thank you Bob Dylan for making some gates from welded found objects; if you hadn't done this they wouldn't have phoned me up and talked to me on air! http://www.bbc.co.uk/news/entertainment-arts-24229623 I will certainly visit this exhibition and see Bob Dylan in a new light now I know we share a love of metal! Following on from completing the posted sculpture I have been straight into the next commission creating a wall mounted piece for a new building in Oxford. This commission has come under a Section 106 requirement of the new development of student accommodation just off Cowley Road in Oxford. 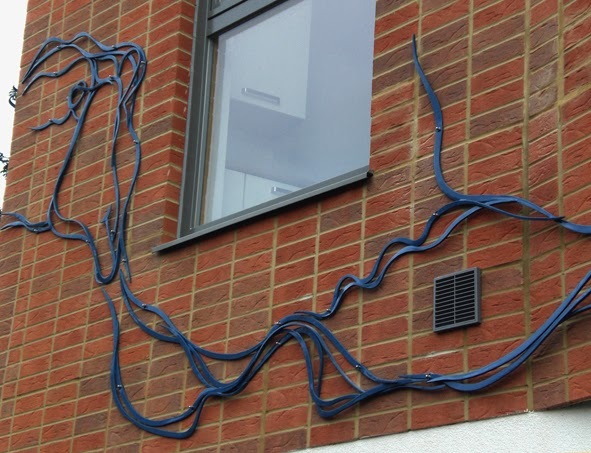 The brief was to create a durable wall mounted sculpture on the main gatehouse building that is on the road front of the development. The walls that I could use were specified by the architect and the commissioners A2 Dominion also wanted me to work with the East Oxford Primary School situated adjacent to the development. 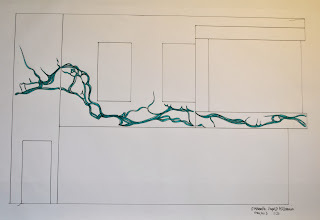 Working with my current theme of maps and journeys I thought the building could take a large scale work that was my interpretation of the River Cherwell flowing to the north of the City. I spent a day with a class in school talking about my work and the pupils worked up sketches based on the river and maps and their recent visit to the river bank. Part of their involvement was to give the new development a name. In May 2013 this class visited my forge and gallery for a day. They had a demonstration of forging and time was spent sketching and exploring the farm including a walk through the bluebell woods. It was a really fantastic day! The design work for this project was really great for me, I enjoy the research aspect and turning a 2D work into a 3D piece that works with the building and location and fulfils the H & S requirements and can be made to fit the building, on time and within budget. The most challenging part was ensuring the metal art work could be fixed to the non-traditional brick-slip construction method - that each fixing hit a mortar joint and wooden batten behind. I made a lovely slotted punch to use for this that gave me some room for error on fixing. The design had some alterations to make it fit the building and has had to be changed as the building has been completed to miss added obstacles like vents but is very true to the sketch work I started with. 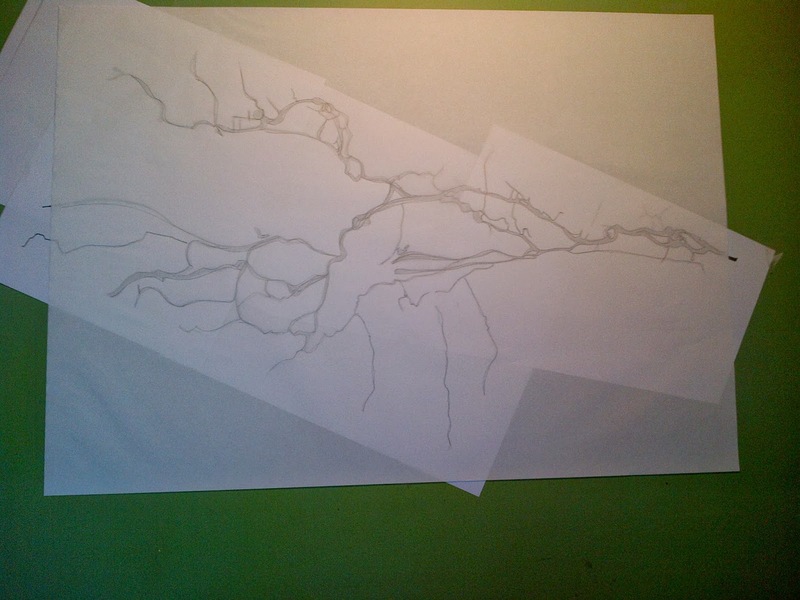 The making part would be where I could add my own interpretation of river flow. The section sizes ranged from 20 x 6 to 30 x 8 and each part was hand forged. The whole 25 metres were broken down into 15 pieces that would fit in the powder coating oven and could be had fitted by two people on a scaffold tower. Due to the construction method, the steel work couldn't come away from the building face any more than 50mm; the weight of the drop wouldn't hold on the wooden battening. The building also had many angle changes for me to accommodate and work with. The whole sculpture does have a rhythm and flow to it from the forging techniques I used. The colour finish was important and has also been used in the entrance gates to the development which I suggested were designed to incorporate square bar uprights turned at an angle across the span. (the curvy design I did for these gates was a step too far!) This has tied the sculpture to the whole development and I feel that the design of the sculpture works well in contrast to the vertical dominance of the architectural style and construction type. The making element of this piece involved 200 making hours by myself and some help on site with measuring and fixing plus 80 hours on design development. I am sure many people will not see the hand forged elements in this work; will not understand the process of forging and how it is as important to the work as the design itself. I know there will be plenty of people who won't like it and have plenty of criticism for public art including this piece but I am really pleased with it and love the journey it has taken me on and the challenges of making and installing that it has thrown at me. If you want to take a look for yourself, go to Cowley Road, Chapel Street just near Tesco and turn right. I am home and all my kit has arrived safely back in the forge, I have my lovely painted 'Melissa's Forge sign on the wall at the back of the workshop to remind me of my time at Ark School. I have great memories of my time in Germany and loved the last day when I got to work with the tiny Foundation stage children making birds from tin foil. It is the best medium, you can do so much with it with small hands and still get the feeling of metal from it. I was given a Leavers Book in assembly on my last day, just like the other children who move on from Ark School as their parents are posted across other bases. It is a great reminder of my time in school and I was really taken with the creative writing and poetry that was read out in assembly by the pupils who were inspired by my visit. I have the post box sculpture assembled in my workshop ready to finish next week. 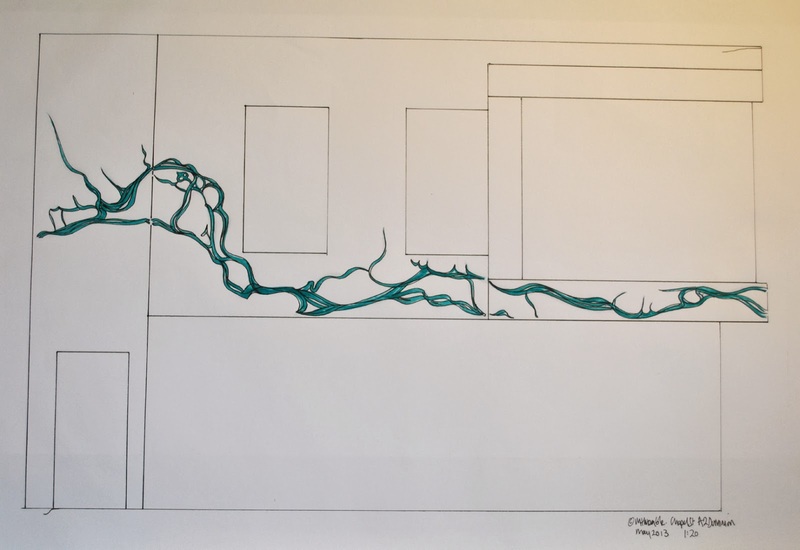 This last two weeks have been taken up with an interview for a public art commission - didn't get it, a bit too exotic an idea for the space unfortunately - and about catching up with the other commissions I have on at the moment. 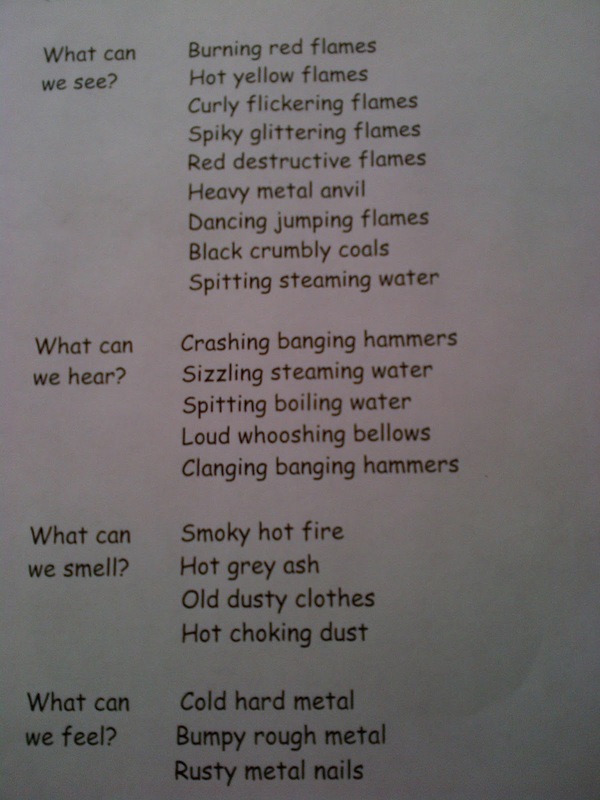 I had a class from East Oxford Primary School visit my forge and gallery this week. I have spent a half day with them talking about my work and the commission for the gate house to new student accommodation currently under construction next door to their school. A2Dominion www.a2dominion.co.uk have commissioned me to design a wall mounted piece for the gate house building and are keen to involve the local community in their plans. 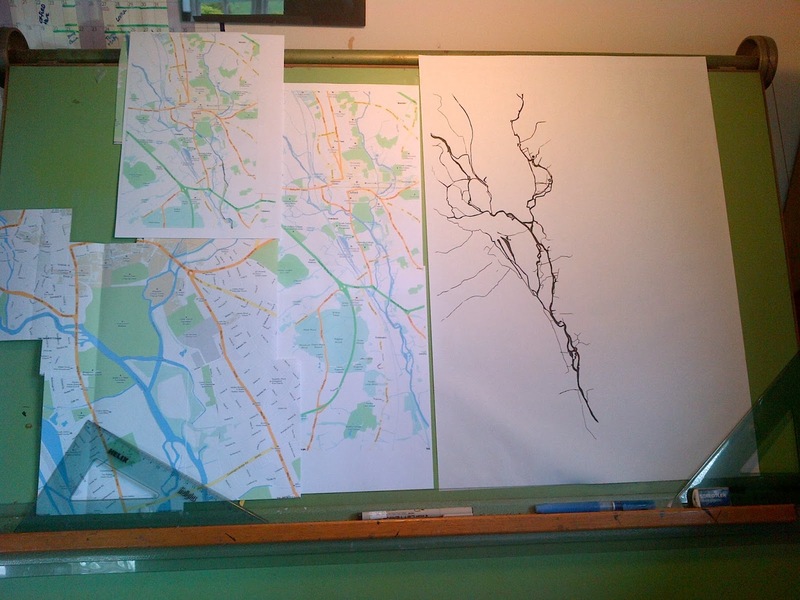 It was a great coincidence that the class i got to work with had been doing some work about the rivers Cherwell and Thames in Oxford as this is the inspiration behind my wall mounted sculpture. Following design work and ideas for names for the new development in the classroom, the class came for a short one day visit to see my workshop and how I work. It was a great visit with really good question and answers about blacksmithing and metal working followed by a look around the gallery and walk through the bluebell woods that surround the workshop. More photos and info on this Oxford commission to follow. This is the last forging day on the project, the last day for anyone who hasn't had a go at making a feather in copper, wire bird or forged feather to try their hand. I had four members of staff come and forge feathers for the bird designed by Toby, this will be just small forged feathers put together to form his bird, pretty much just like his drawing. Year 5 came and made individual copper feathers to take home, they worked really well as a class and the end results were fantastic. Year 6 made small wire birds in the afternoon, again to take home. Today we had Jack, a pupil from Windsor school come with a professional photographer (David) to document the project. Jack only stayed for an hour due to exams but David stayed all day capturing the processes and children at work. This was organised by Joy Harris Service Children's Education Arts Adviser who also visited. Joy has been involved in sorting the contract for this project working with Mike Chislett to make it all happen behind the scenes. I had lots of visits from classes to bring me drawings or pieces of creative writing which I am keeping in my sketch book for this project. Jasmeet from Year 4 wrote "Beautiful 3D birds flap around the red British mail box going to wonderful places" Perfect! At the end of the day I laid out on the playground the finished birds for everyone to see and the wire birds were placed on the 'bird table' in the tent. Because this was the last forging session, I offered to do a demonstration for parents and children at the end of school, making a snail to climb up the post box stand. I had an able assistant in parent Matt who pumped the bellows and had a go at drawing down - an appropriate technique given that this is the same military terminology for the closure of JHQ. I thought maybe a few people might show up and I would do a little bit of chat as I worked but I was very wrong! Rather brilliantly Sheila, year 1 teacher closed her class room early and stuck a note on their door asking parents to collect their children from the forge area of the playground, some 500 metres away from their class room. Sheila has regularly brought her little ones over to watch the forging during the two weeks, they always wear white hats that they have decorated themselves! There were a lot of parents and children there! I was quite taken aback and genuinely surprised to see this. Jason and Bill from Cassells House also came to watch which was very lovely. I worked on the snail as fast as I have probably forged a 12mm dia bar. Fortunately it all went well and I finished in about 35 minutes without burning the eyes off the snail. I was kindly given a bunch of lovely tulips at the end - I love getting flowers! It was as great way to end the project and the fab poster that Mr Rowles drew for this demonstration event will go on my workshop wall! It was really good for so many people to see the post box and birds at this 'work in progress' stage and get people taking about where it should be located at the end. There is a train of thought of it being placed in the woods at JHQ, so you would stumble across it. I like this idea but worry it wouldn't be looked after. I think it is as great idea for a post card though so will try to do this before I send it back finished, I would like everyone at the school and at JHQ to have a post card image of this sculpture to keep. I have one more morning session to do with Foundation Stage pupils and then load up the kit and say my goodbyes - that is tomorrow- today was great! Today I had lovely Year 2 to work with, the last class to spend their day with me. They started off watching the demonstration and asked really great questions and stayed fully attentive for the whole demo which I was really impressed about. With so many questions I had gone over my allotted time! 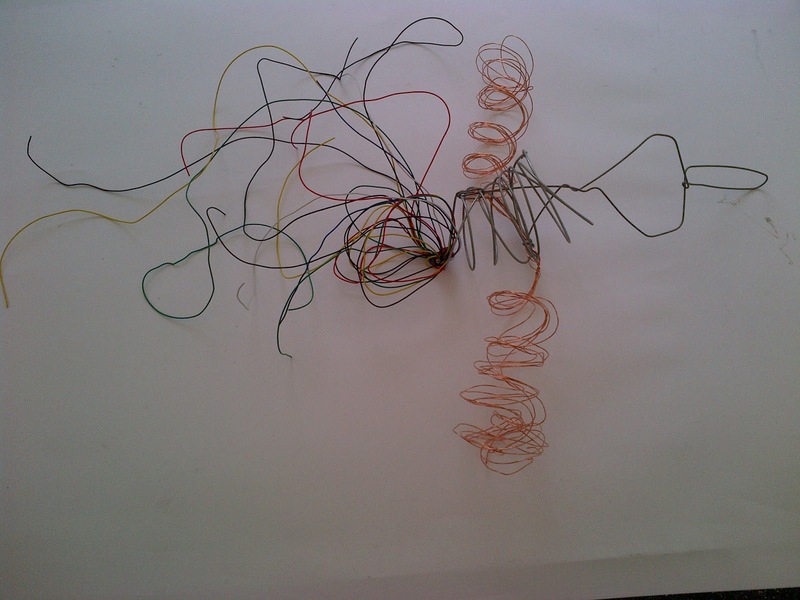 We worked through with this class on a 1:1 ratio making wire birds from the selection of wire available. Each child has around 30 minutes to do this , including getting their 'little blacksmith' uniform on of glasses,gloves and leather aprons; this is brilliant in itself mainly as the gloves and aprons are leather and dirty and smell different and the glasses are really little to fit the smallest children so everything is in the right proportion! It took me years to find the right small glasses suitable for children! The gloves are leather gardening gloves and I made the aprons myself so they would not be flapping around by their feet! One of the pupils I worked with had the most amazing dexterity and patience. Working steadily and methodically, carefully and creatively to weave her wire bird with really no assistance from me other than finishing off cut ends. I was so impressed with this little girl, she will make an amazing weaver one day! I also worked with a Foundation stage pupil, the youngest in school and he managed to make this lovely bird with loop-de-loop spiral wings! Year six came and did some observational drawing outside today, i am looking forward to seeing those and tomorrow is the last making day so we will be able to give some of these pupils a second making session. I will be doing a demonstration for parents and anyone at JHQ to watch at 3.20 in the playground, Ark School on Thursday 9th May. Come along if you like! Today's making time was kindly given by Head Teacher of Ark School Mr Chislett to the local German School from Hardt. They came with 6 pupils and two teachers and one older pupil to document their day! I love this kind of cross school/age group involvement in a community school project. Each pupil spoke a little English, my German is pretty much non-existent which is rather awkward in this situation - I wish I had learnt more languages at school! We had a translator for the day in German/English teacher Ludovic who was able to communicate all the bits I was worried about, mainly the health and safety part! The school hadn't realised quite how hands on they would be with the metal work, it was a revelation to discover all the forging equipment in the playground and that they would be working the forge themselves. We started with a demonstration for forging, we were making one of their own designed birds so I used that design as an example of how to forge the shapes we needed. Each pupil was able to make a feather from sheet copper, cutting and working the metal to finish with delicate formed feathers with loads of hammer detailing. The pupils then worked with me on the forge to finish forging their bird from 8 mm round bar, forging tapers, flattening and texturing them and bending the bar to the required shape with scrolling horns and over the bick. It was a really successful day in school, the pupils were fantastic and loved what they achieved. 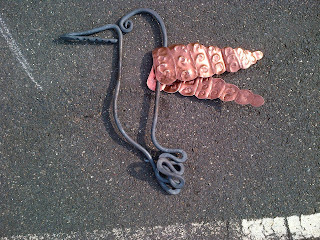 Both staff members had a go at forging and contributed to their bird. They were properly impressed with the set up, organisation and kit available which was really nice for me to hear! They don't do hot metal work in schools in Germany, much like in the UK where it has been squeezed out through prioritising 'resistant materials' work in plastics and wood. They also don't have the metal working tools or equipment available to them in schools and would also find health and safety restrictions on what they would as teachers be allowed to do with heat. They do some work with brass; machining and polishing. For Germany and in the UK the important issue of who would teach metal working skills in schools, there aren't the people going into teaching with the relevant skills because they aren't taught it themselves at school. It's a no-win situation really and will be irreversible soon. It is such a shame to see hand skills and craftsmanship lost to the computer orientated skills, there should be a place within education to learn both at some stage in a child's education. There is a whole section of young people out there that would have benefited from doing hands on metal working and wood working; making, doing and learning with their hands. It feels like 'hand-skills' is a dirty word within the education system; that it is not progressive enough? It can be progressive and when combined with modern engineering the opportunities for learning are boundless. There is nothing wrong with learning traditional skills, there is a place for them in our educational and wider world as much as there are people out there who will be fantastic craftsmen and women for the future. We just need to introduce them to the opportunities of trying it out as young people when they are at school. Today's after school session in the rain saw Mrs Chislett finally get to forge her very own feather, having watched demo's by me all last week, i set her loose on the forge and away she went, very successfully making her feather with texture and shape just like a pro! There will be no stopping her now! A much deserved making session of her own after 7 days of being my runner and assistant! We also had 3 lovely ladies come and make copper feathers and forge a point before the rain stopped us and dampened the coal a little too much! What a fantastic day we have had at Ark School! The sun shone all day, even hot enough to warm the metal and tools without using the forge! I was working with teacher Mrs Rickards and her Year 3 class today and brilliantly the class decided to have their whole day outside in the tented area working alongside me an using the time to get lots of creative writing, poetry, observational drawing and making done! This is just how I love to see my visit in a school used to its full potential! The gorgeous copper wings were made last week and today we forged the body using fish-end tapers and scrolls for the lovely tail, scroll work for the wing supports and Mr Rowles to forge a head for his bird. It has been a really successful making day today and each pupil has really got absorbed in the whole experience making for a truly memorable time! 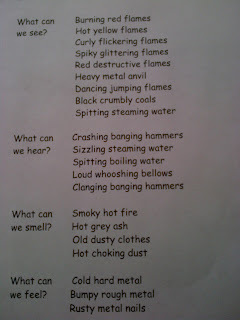 We also had great support from LSA Mrs Davies with the copper work, she used all the new words connected to the processes and got the children exploring techniques and language; development from design to the finished piece and thinking about their experience in a broader sense than the immediacy of hand hammer work. Fantastic! I am so focused on the safety of the children pumping the bellows and hammering that I don't always get chance to talk through the more detailed aspect of what we are doing with them. It is great that this school are getting so many people involved, using the experience to let staff gain new skills alongside the pupils. Staying at JHQ and exploring the local area. For me not being used to military life it was slightly daunting to come and stay at JHQ for a two week duration while working at ARK School. I am so used to my freedom and autonomy as an artist, military life is almost the exact opposite I imagine. I have been allocated a room in Cassels House which is available for members of the military to stay in if they have work to do at JHQ or are passing through on their way to another base. The building is just like all the others here, solidly built in the 1950's and updated with double glazed windows and fresh coats of standard issue magnolia and steel grey paint. I have been made to feel so welcome by the staff here and they have been so helpful, making my job easier while I am here. It all goes on in the courtyard area, people congregate here in the evenings and I love hearing about how people ended up in the military, what their jobs are and what their plans are for the future. Being here as the base is closing down gives me a slightly different insight into military life I am sure. It can't be great not knowing where you will next be posted when you know that BFG is closing down more bases than previously thought, it must however bring these 'last men standing' together knowing that they are all pretty much in the same situation. I was really interested to talk to www.jasonblackmore.co.uk who is working here in Cassells House. 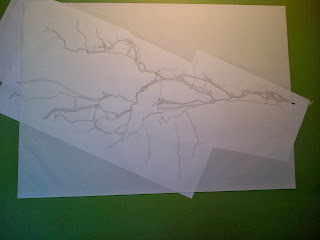 He is an artist working predominantly in 2D and is hoping get a place in Dusseldorf or Berlin to study further. Having read on another blog about how working within the military was an opportunity to get out to Germany and get work to support his art practice he applied to work with the NAAFI. He now shares a studio with a well known picture framer and is able to continue with his art practice while working for the NAFFI. I was able to borrow a bicycle and take a ride through the lovely countryside here and have supper in a local restaurant. It was a German Bank Holiday on Wednesday and there were loads of people out and about on bikes enjoying the great tracks and paths available to them. On my day off, Head Teacher Mike kindly took me to Dusseldorf, a thriving city with a rather chi chi look about its inhabitants! It all seemed quite glossy and smart and very very busy! We cycled from a small village with a windmill following dedicated cycle paths to a ferry crossing to get to the east bank of the Rhine - a really wide river with a strong current and plenty of big ships transporting goods. From there we cycled the 12 km through orchards and lovely countryside into the outskirts of the city then past the university into the city centre. I am much better in woods and fields on a bike than I am in the city! After a lovely lunch in the oldest bar/restaurant in town we decided to take the tram back part way with the bikes, this was mad! got off as soon as we were in open air and cycled the bumpy path alongside the river back to the ferry. It was great to explore the countryside like this, the cycle paths and footpaths being so well marked out and maintained made it an easy option. Sunday is a day of rest and recreation in Germany, I am not allowed to do manual labour so will get cracking with design work for the next commission in Oxford. The end of the week was really hot and sunny on the playground, working with year 4. We managed to get some birds completed today so are only a little behind schedule. Year four had some pupils with real strength and accuracy which enabled them to push on with the work. The bird we made was designed by Lauren and she was the last person to work the forge with me today. We made the outline of her bird from 8 mm round bar in one piece, pushing my skills to make this manageable and workable for the children. Making a taper and forging a scroll for the eye was straight forward, making over lapping loops for the tail feathers which could then be hammered flat and scrunched up into a more 3D shape was slightly more tricky but it worked. Lauren got the final job of hammering the metal on the edge of the anvil to make 'teeth' for the beak. The copper wings were hammered out carefully with scroll punched details on each and it is now ready for me to finish up rivet together when the steel work has been painted and finished. Today I was joined by six pupils and their teacher from Windsor School based at JHQ. A couple of these pupils had previously attended Ark School so it was great for them to return for a day. They were a fantastic bunch, they got totally into making copper feathers using repousse techniques and although they have done some cold metal work in school, the forge was a new experience for them. We were working on one of the birds designed by a member of staff; all the children and staff at Ark School designed a bird, the favourite 20 were chosen by all the pupils after the drawings were displayed on the big wall in the hall, from these I choose 10 designs I thought would work up well in metal. The school devised a great way to share ownership of an art project by using this selection process. 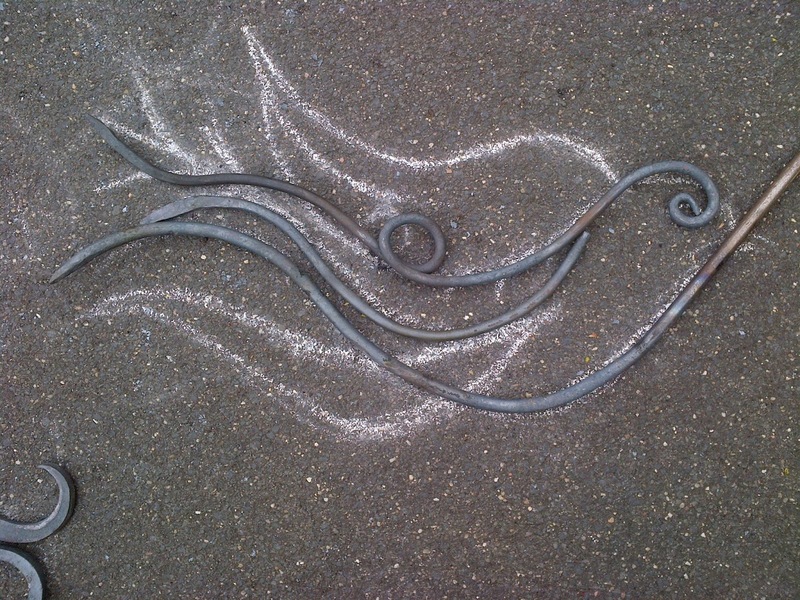 The dove we were forging today is nearly complete, a few lines to finish and some joining to be done at home for me. 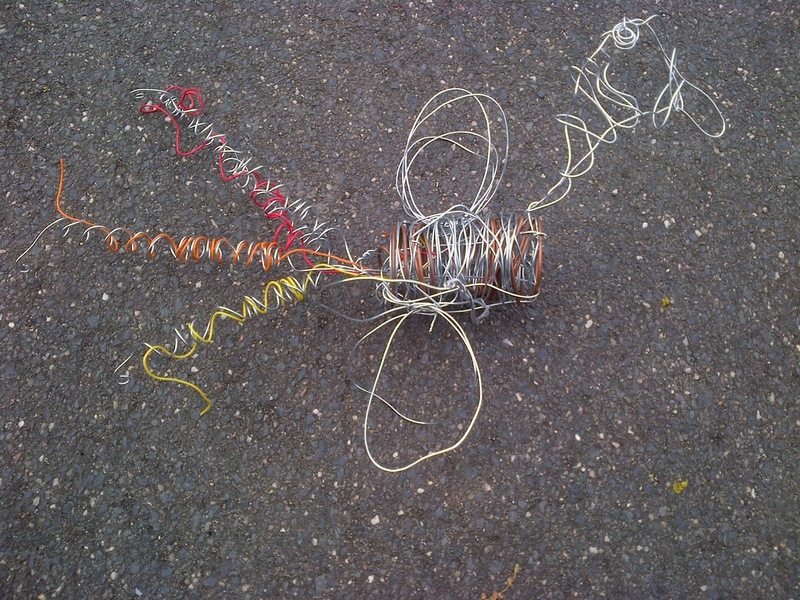 I had an amazing day making wire birds with Year 1 pupils, it was really lovely for me to work with the younger children on this project, not something I usually get time for when working in schools. Fantastic help was provided by Mrs C and Mr R and Yr 1 LSA so each child had 1:1 help. I love the way the children choose which wire they think is suitable and then even if they don't think they are 'big' enough to do it, they get really stuck in and start creating! They amaze themselves and gain in confidence as they make, it makes me really enjoy teaching! 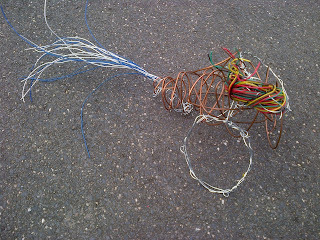 I owe this wire working skill to www.celia-smith.co.uk who worked with some school groups at Puthall Park Sculpture Show in 2004 and 2006. 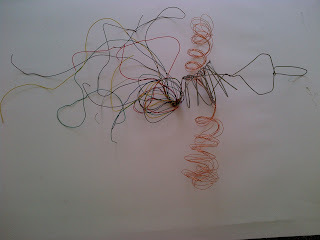 I think she has the best wire work sculptures out there and was a joy to watch working. Take a peek at these marvellous creations from yesterday! 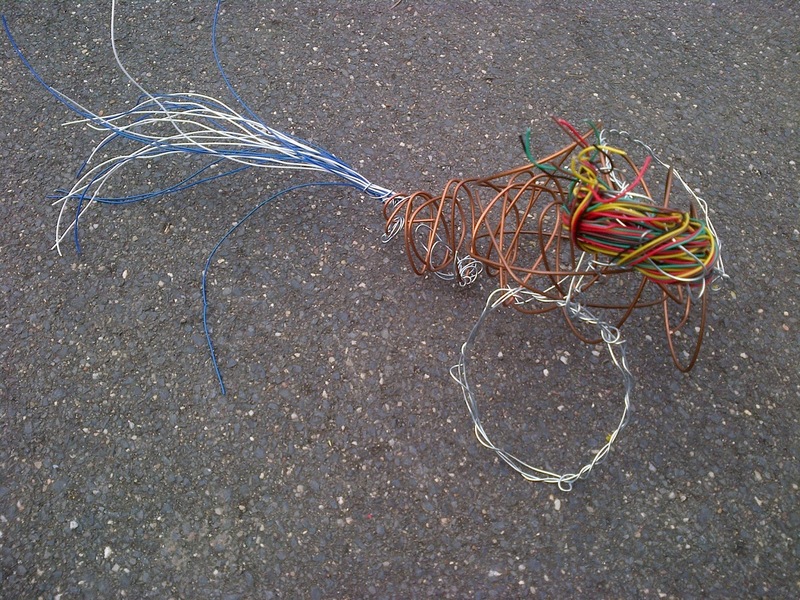 At the end of the project there will be an amazing flock of wire birds hanging in the school hall for everyone to see. I can't wait to get a photo of that! My tools and I have safely arrived at The Ark School JHQ Rheindahlen. We have a lovely working area set aside in the school playground using two old garages as dry workshop and storage space. Day one went really well working with year six pupils on their lovely designed bird with a big scrolled head detail. The after school session involved a demo for the teachers so they could understand what their classes would be able to experience over the next two weeks. 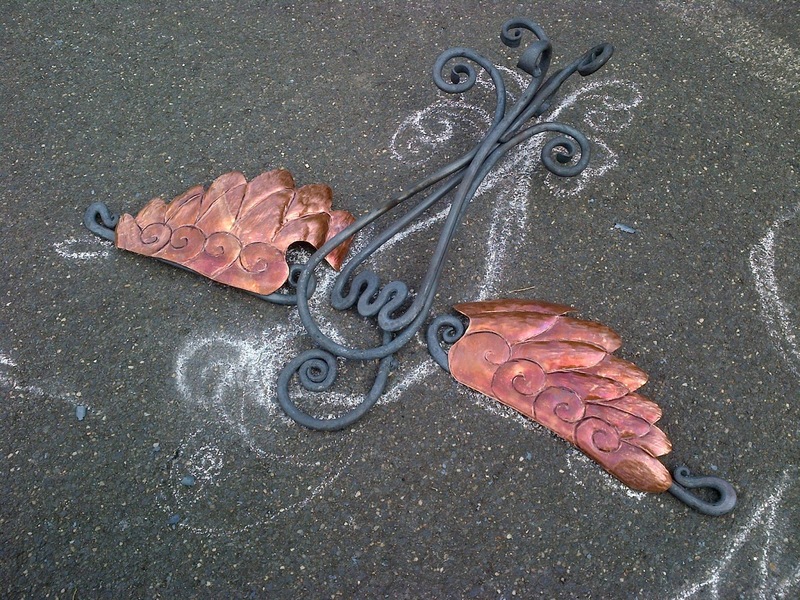 Today I worked with year five on their Phoenix style bird, they made a cracking job of the copper repousse wings and forged body and tail parts. We had a visit from the Garrison H & S inspector too. 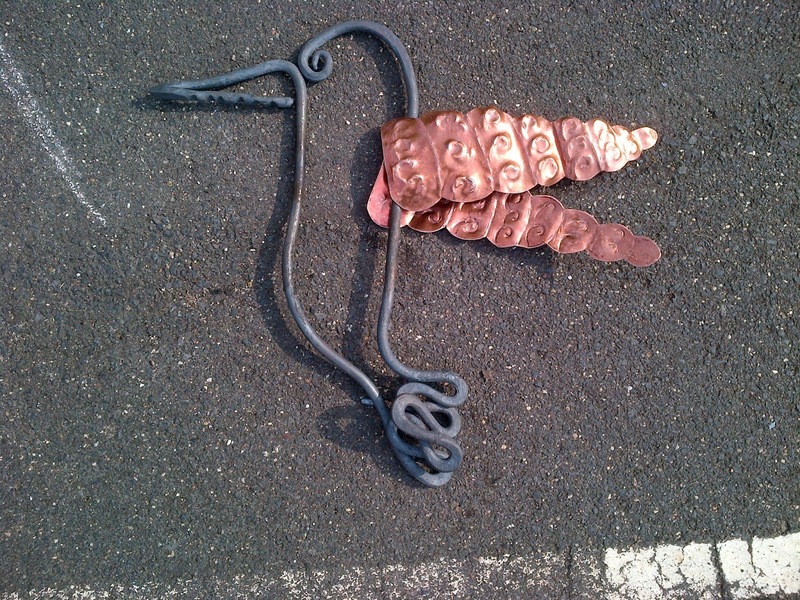 After school was a group of six teachers and LSA staff who each made a copper or forged feather. The play ground now has lovely chalk bird drawings all over it! I love the sign that Ark Schools very own artist Mr Rowles painted for my forging area! I have just loaded up my small Victorian bellows forge and little anvil plus approx half a ton of hand tools into a van that is now scurrying over to Germany. Organising and sorting through my workshop to find the right tools to take to JHQ Monchengladbach for this project has taken far longer than I ever thought. I have slight panic attacks about those precious tools going missing in transit but know I have another chapter for my children's story book which i ought to get on and write soon! The children at The Ark School will be the focus for this project and they have already provided me with fantastic drawings of birds for our sculpture. While I am on site for the next two weeks, we will be forging birds for their sculpture and making wire and foil birds with the youngest children. I thought a lot about the language used whilst I was at JHQ and the physical implications of the closure of the base and relocation of the residents over the years. I was very taken with the map of the world in school and postcards sent back to school from children that have moved on. Nearly everyone I talked to, children and adults used the word POST in their conversation; it was of course in reference to the place they would be stationed next or before JHQ but it also resonates in a different way for me. I see it in some way as a migration, the ‘flock’ of people stationed at JHQ moving on in a positive and direct way. I want to leave a little piece of British-ness behind in the work and capture the international nature of the role of JHQ over the last half century. I also want to recognize the vital role of old fashioned letters and postcards as the means by which people communicated with each other – 'blueys' being a fantastic example and which may become a colour link. The physical act of writing on paper and posting in a box a letter that will be transported by people across the world is still a special thing. It was also a crucial form of communication when JHQ was first built. I want to make a sculpture that uses a Royal Mail post box as its base, from the letter-box mouth will be steel lines in a flowing pattern linking birds in flight together, swooping and playing above the box. The children would design the birds and I will devise a way of making the whole thing work. With the forge on site we would work on the birds and smaller linking steel work. The main structural work would be done at my workshop. The possibility of using the actual ER post box from the base would be fantastic and it also makes it easier to have a free-standing piece that has a big visual impact. I think it would be relatively straight forward to install the post box. I would need to make an internal structure to support and fix the art work to. I would love to have the JHQ official closure date as the ‘Last Post’ mark on the box. More updates on my time at JHQ over the next couple of weeks will follow.